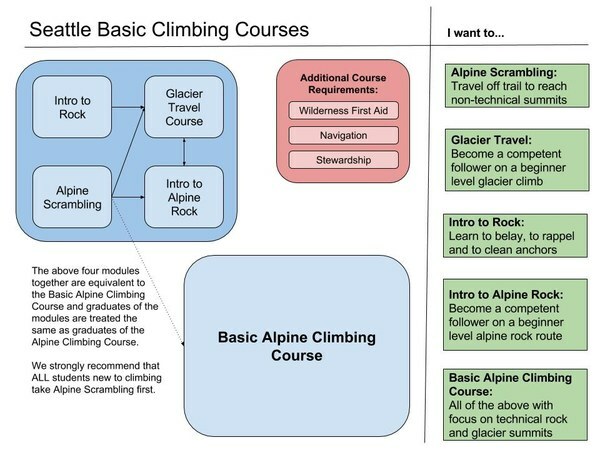 The Basic Alpine Climbing Course is a program of classroom and field instruction designed to teach new climbers the skills and experience required to safely follow on rock, snow, and glaciated routes in the Pacific Northwest. Course graduates are eligible to participate in basic club climbs, alpine scrambles, winter snowshoe trips, the intermediate climbing course, specialty climbing seminars, and many other activities offered by The Mountaineers. For students new to climbing, we strongly recommend the Alpine Scrambling Course as first entry point into The Mountaineers' climbing program as the ability to travel safely and efficiently on third and forth class terrain is presumed in the Basic Alpine Climbing Course. The course curriculum includes five class meetings, seven field trips and a minimum of three basic experience climbs. Students are assigned to a Small Instructional Group (SIG) of approximately ten students and one leader, who will conduct two of the field trips and hold additional learning and practice sessions. a stewardship activity - typically a day of trail maintenance. Lectures and field trips run from January to early June, with climbs going from May into October. Registration opens around October 1. In addition to the Basic Alpine Climbing Course, we offer students the option to take four smaller courses (or modules) that in combination teach the same skills as the Basic Alpine Climbing Course: the four modules are Alpine Scrambling, Intro to Rock, the Glacier Course and Intro to Alpine Rock. The advantage of taking four shorter courses instead of one is that in the modules students get more time to practice each skill in depth and also get the opportunity to gain some experience using the new skill set, e.g. by going on some glacier climbs as part of the Glacier Course, or by going scrambling as part of the Alpine Scrambling course. The shorter courses also allow for more flexible scheduling to fit the students needs. The Intense Basic Alpine Climbing course compresses the regular course into 9 continuous and full days. It is a comprehensive and thorough program in training to become a competent climbing partner on technical rock, snow, and glacier climbs in the Pacific Northwest and beyond.